FOUNTAIN INN, S.C. (October 18, 2018) – AVX Corporation, a leading manufacturer and supplier of advanced electronic components and interconnect, sensor, control, and antenna solutions, will be featured in a nationally aired commercial on the Fox Business Network® on Thursday, October 18, and Sunday, October 21, as well as in an upcoming production of “Success,” hosted by actor Rob Lowe. 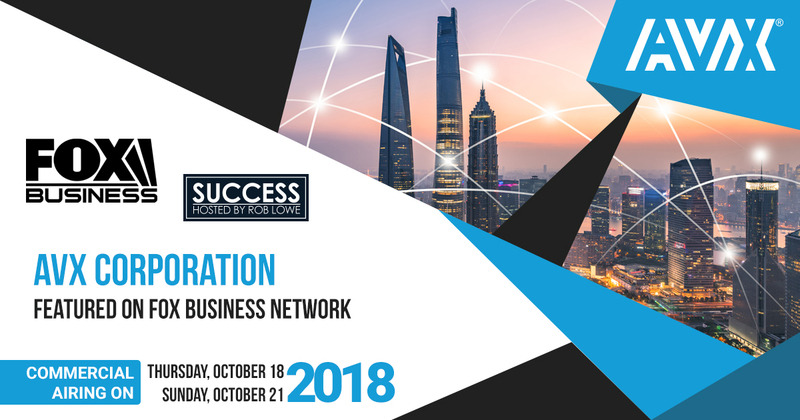 “Success” is an award-winning program that highlights innovative concepts and stories stemming from a variety of topics, including education, health, business, and more, through short-form and long-form documentary presentation. AVX’s five-minute segment will focus on the company’s state-of-the-art components that are designed for real-world product applications, including aerospace, defense, consumer electronic, advanced automotive, and medical device technology.